Vinita Dubey Pande: Hindus are Not "non-believers". Pls do Not kill or convert. Hindus are Not "non-believers". Pls do Not kill or convert. 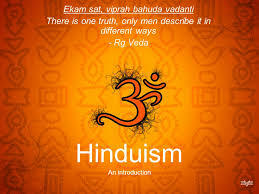 Hinduism not only believes in One God (Ishvar), but that our soul (Atma) is also the same substance, as that One God. Like the wave and the ocean. It says that the goal of life is to experience that union with God (Moksh). It's not that we need to become divine, but remove the obstacles that stand between the idea of "I" and the true bigger Self. Karm and Vasanas are these obstacles. Vasanas are the tendencies, impressions, and patterns that keep us in a cage of limitations. Karm and Vasanas are caused by the ignorance of our true divine nature, Oneness with the creator, and our separation from the whole. We come to believe that we are this limited mind and body. This is the philosophy of the Vedas. The methodology of the Gita and Vedas to remove these obstacles is through the process of purification, calmness, clarity, knowledge and the experience of our soul. This is true Yoga. Then we can evolve and attain liberation from misery and become our unlimited blissful Self! Then That higher Self flows through the apparatus of mind/body as it's meant to. Not that we function from the ignorant, limited, and separate mind/body personality. Most other religions do not talk about 'Atma' (soul consciousness), and it's oneness with the eternal infinite consciousness, 'Brahman'. Nor do other religions talk about 'Moksh' (liberation/enlightenment). Most religions separate God, nature, and the individual. Even though God is everything, they don't emphasize that the individual is God as well. The enlightened masters of the Vedas realized that not only is there One consciousness but that we are also That (Brahman). Therefore God consciousness and I are not two. Non-duality. I can say, "I am God consciousness." It's not blasphemy as in Judaism, Christianity or Islam. I was telling a Christian pastor that in Hinduism, the Vedas say enlightenment is the purpose of life. Enlightenment is becoming one with that eternal soul (Atma) that is the same as the eternal God consciousness (Brahman). That is to become God. He stared at me because that's foreign to Christianity and other religions where it would be called blasphemy. Right? Jesus was stoned by the Jews for saying, "I and the Father are One." But a Christian can't say the same. The mystics of Islam (Sufis), Judaism (Kabbalah), and Christianity (Gnostics) expressed the experience of the union with the divine. The Sufi mystic, Mansur Al-Hajjaj, was killed for saying he is God because he experienced that beautiful union with the divine. A grand experience! How could he deny it? Enlightenment is expounded upon a great deal in Sanatan Dharm (Hinduism) because the people who studied it were highly intellectual. Like the Egyptians and their knowledge. In other parts of the world where people were illiterate and simple, they were taught some basic principles, values, and that there is One God. The highest knowledge, the mystical knowledge, was given to few selected evolved followers, in that enlightenment was disclosed. Like Jesus taught Thomas in the Gnostic Gospel of Thomas, that was removed from Bible by Constantine and only now it's been found. Jesus used to meditate at sunrise and sunset. Prophet Mohammad used to meditate. I had investigated this when I was a teenager with an angst to know the truth. Also, Sanatan Dharm (Hinduism) doesn't have just one source of input for it's vast knowledge, like Jesus or Prophet Mohammad. It is a conglomerate of all truthful messengers, philosophies, methodologies. The enlightened Rishis who channeled the Vedas from highest Consciousness lived worldwide. The Vedas say, truth is one but expressed by various truthful, enlightened messengers using different languages and terms over time and place. That is why it has added all spiritual masters to its expanding plethora of knowledge over time. Even the atheistic philosophies was added because it gives space for all to grow. Buddha was added as an Avatar. Buddhism was added as atheistic philosophy because Buddha said there is no God or Soul. Jesus was added as Isa Masiha (Messenger of God), when Saint Thomas brought Christianity to Bharat (India). Prophet Mohammad was not added because the Muslims first came as conquerors converting and killing Hindu "non-believers". If the Sufi saints or Imams had come first, then Prohphet Mohammad and Holy Quran would've also been added. As we move forward we will have to transcend our limited belief systems and accept truth from all sources. We will have to realize the new and revised version of religions that have all been distorted. Killing and converting of "non-believers" is wrong. This is very important to know, to expand our limited understanding and limiting ourselves by a religion. We need to transcend "religion" and go back to universal wisdom and values.